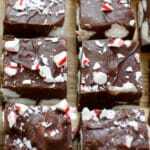 Peppermint Marshmallow Fudge is rich and creamy dark chocolate fudge, flavored with peppermint, and loaded with bites of marshmallow. (If you don’t happen to be a fan of dark chocolate, semi-sweet or milk chocolate will work nicely.) A sprinkling of crushed candy canes on top makes this an altogether too tempting treat for me. My plan was to make a few batches early and then hide them in the freezer for gifting later, but I wound up sending this off to work with my husband because I couldn’t stay out of it. I’ve completely fallen in love with Five Minute Fudge. The fudge turns out smooth and creamy without all of the traditional time spent stirring the pot on the stove. It’s a good thing it isn’t candy-making season year round, right? Just the tiniest piece of this Peppermint Marshmallow Fudge satisfied me… for about an hour. Then I’d find myself back in the kitchen slicing off another teeny sliver. This is dangerously rich, sweet and tempting! Five-minute fudge recipes are my saving grace this time of year. I always want to be that hostess or friend with tons of holiday treats at her fingertips, but then time gets away from me. Lightning fast candy recipes can help you put together the prettiest and tastiest of holiday treats with the least amount of effort. As an added bonus, a piece of this fudge will melt beautifully into a steaming mug of milk and make a wonderful cup of peppermint hot chocolate! I’ve already stashed this fudge in the freezer to make cocoa on Christmas morning. For more peppermint treats, check out this Peppermint Ice Cream, it’s crazy good and absolutely amazing with a slice of this Chocolate Cake. Peppermint Hot Chocolate Mix is a staple in our house through the holidays. I like to keep small jars of this cocoa mix on hand for gifts too. For more peppermint ideas, this Candy Cane Body Scrub, these Candy Cane and Lime Bath Soaks, and this Lime Mint Foot Soak sound fantastic. These DIY Peppermint Candy Gifts would be fun to make with the kids too. I love any kind of fudge.. but add a little mint to my chocolate and it's pretty close to heaven!!! I was going to make my grandma's fudge this weekend, but maybe I'll try this one instead!! 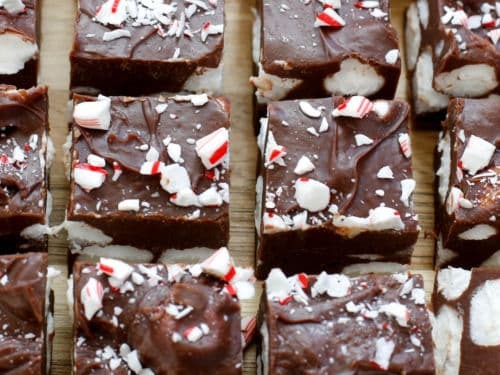 This is total chocolate-peppermint perfection, Mary! Such a great edible gift! Am I missing something? much peppermint candy cane? Thanks for the catch. I've added the amount! 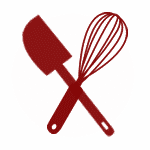 instead of pouring into a "well greased pan" , will using parchment paper or wax paper in the pan do? Yes, parchment paper is always my preference, but well-greased works as well. My marshmallows are floating. Is that normal? I don't care that it's not even holiday season...I want to make this right now in the heat of summer! It looks delicious! I set it out at room temp 30 minutes to an hour before serving. Most fudge recipes will thaw to room temp in that time.